Smaller companies are experimenting with new flavors, textures, and even temperatures. Many of them are startups and are tapping into the consumer’s desire for local ingredients. Do some research and see if you have any up and coming brands in your area you would like to sell in your store. 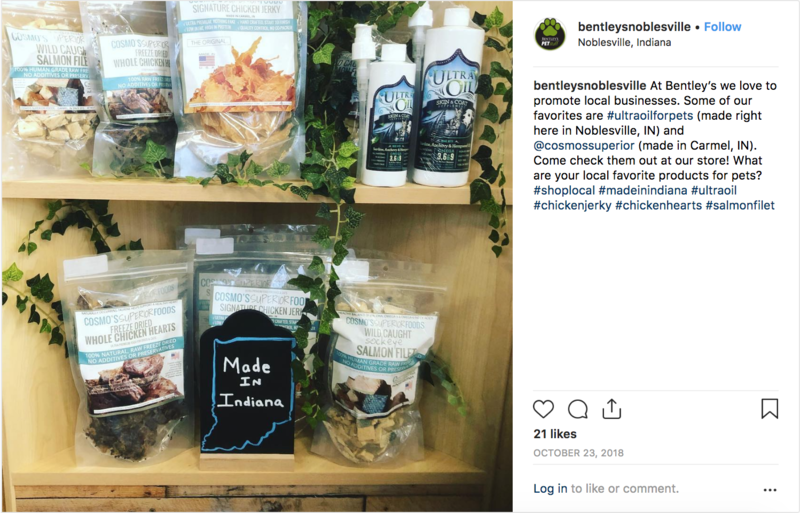 This Bentley's Pet Stuff in Noblesville, Indiana promotes locally made treats and fish oil supplements from Ultra Oil for Pets and Cosmo's Superior. One of the biggest benefits of carrying locally made products is that you are able to offer your customers something they cannot get in a big box store. Differentiating your product mix with products exclusive to independent retailers and locally made products is what will keep your sales thriving in 2019. Before domestication, dogs and cats ate a lot of protein (and whatever else they could find in the wild). Some brands are capitalizing on this ancestral link with great success. This includes foods with a single protein, protein as a leading ingredient, or even multiple proteins and exotic protein foods. Kriser's highlighted Zignature a brand with exotic protein formulas such as goat and kangaroo online. 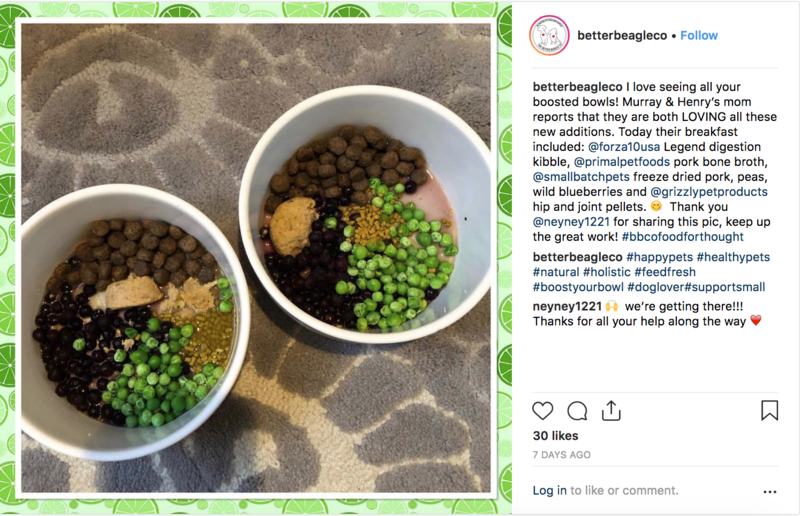 A social post like this can let people in your area know that you have the answer to their pet's protein allergy issue. Novel or exotic proteins like kangaroo, venison, rabbit, and mackerel not only offer new taste experiences, but they can also alleviate food allergies in dogs who are allergic to chicken or beef. Investigations into insect protein are also on the rise and we’ll see where that goes in 2019. So, if you don't already have some of these unique protein formulas in your store consider adding a few to you shelves. Whether it’s supplementing commercial pet food with home-cooked veggies or meat or embracing a raw diet, there are many do-it-yourself approaches pet owners can take when it comes to preparing their pet’s meals. Many pet parents have never prepared food for their pets and the idea of cooking a meal for their pet on top of the food they prepare for themselves can be overwhelming. This is the perfect opportunity for you to establish yourself as a trusted resource for fresh DIY pet food. Introduce customers to frozen and freeze dried raw, green supplements, bone broth toppers, and meal prep bowls. This post from Wishbone Pet Co. shows how easily a customer can create personalized treats they can serve on their own or with food by freezing Answers raw goat's milk and Green Juju topper together in cute silicon molds. Consider highlighting this pet food trend in your store for a week or even a month. Set up displays, hold free sample and information events on alternative diets, and share quick tips and information with your customers through email and social media. Once you help a customer build their pet's bowl, encourage them to share a picture with you so you can post it on social media like Better Beagle Co. has done above. Last year, we saw a rise in popularity for treats and supplements featuring CBD hemp oils. The pet CBD industry continues to develop with more and more brands saturating the market. This year you can capitalize on this trend by showing customers, you are the best resource to learn more about CBD. Make sure you are ready for pet parents that are looking to these alternative supplements to improve their pet's health. 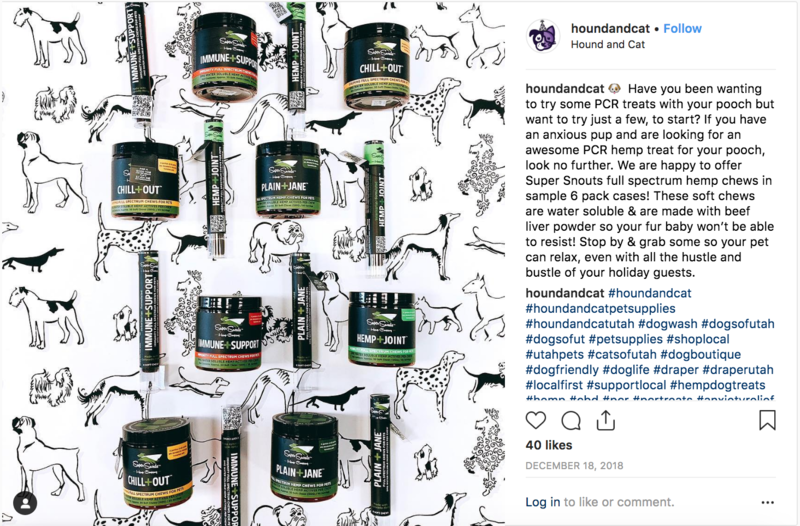 This post from Hound & Cat in Draper,UT does a great job of highlighting CBD treats and supplements. They use the caption to establish a call-to-action that will get customers in the door. An Innova trends survey found that “64 percent of U.S. and U.K. consumers expect companies to invest in sustainability.” That can mean using recycled packaging of finding new ways to use formerly wasted material. Support sustainability in your store by highlighting sustainable practices and products. Maybe you are a Terracycle drop-off point and carry products that use Terracycle packaging or you carry products that practice sustainable sourcing and manufacturing. Take the time to let these brands shine by creating displays featuring their products, host a free sample events, and hold a sale on these products for your customers. 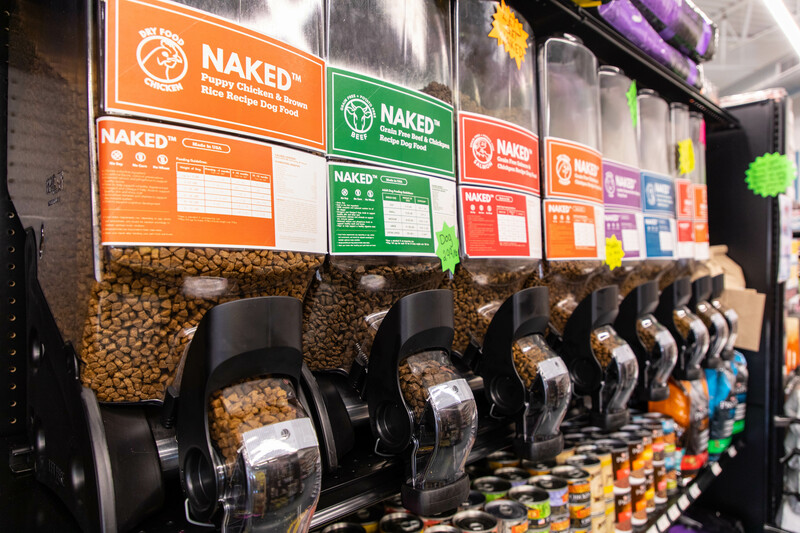 The Naked Co. Food dispensers are easy to use and allow pet parents the opportunity to choose how much food they can buy at once. Naked Co. Food is a great example of a sustainable brand. They cut down on waste by using food dispensers and providing paper bags without ink so they can be easily recycled. Customers get the added benefit of bringing their own container and get to personalize food by mixing proteins and formulas. Competing with online retail giants like Chewy and Amazon can be incredibly intimidating especially when you find that online pet sales are on the rise. How can you capitalize on this? Luckily as an independent pet store you carry brands that pet parents can only find in a store like yours. Compete with online retail giants you can create the ultimate shopping experience in store while offering the convenience of online shopping by using a service like Etail Pet. Etail Pet is a great way to get started in the E-commerce world. Check out Etail Pet if you are looking to get started in online retail. You can still entice customers in your store using in-store only promotions sent through e-blasts using the customer data you gain from online sales. Etail allows you to provide customers with the option of buy online and pick up in-store which makes getting customers in the door that much easier. As you can see, the pet industry continues to expand and diversify much like the human market. 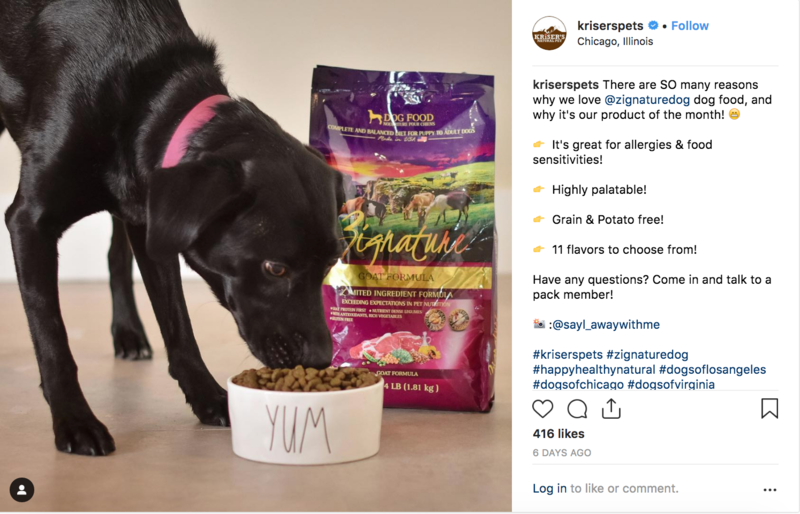 CBD, probiotics, Paleolithic, pet meal assembly kits and everything else trending in the human market is mirrored in the pet market. Keeping up with the constantly changing trends can be difficult but by keeping your finger on the pulse of the industry will make sure you are always prepared. A web writer since 2005, Jen’s written over 1000 articles on pet-related topics. She’s also led dozens of blogging and social media-themed workshops for small businesses around the country both virtually and in person. Passionate about both pets and digital marketing, you can find out more at jenphillipsapril.com. When not working with her fabulous clients, you can find her eating tacos and practicing her Spanish in her adopted home of the Riviera Maya.